The iconic Botanic Garden range has been gracing homes since it was launched in 1972, a true English classic loved by generations. Today its delightful mixture of beautiful motifs has been joined by exotic flora and fauna from tropical climates. Bursts of magnificent petals are interspersed with delicately detailed butterflies from warmer climes. 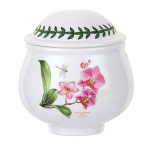 Having exactly the same qualities as the original Botanic Garden range, this collection will merge effortlessly into your existing Botanic Garden collection.